It was not long ago when the Edison Electric Illuminating company supplied 600kW of energy from 6-dynamos to 85 customers. Just in a gap of 125 years the world has changed so much that 20,000 TWh of electric power is generated and supplied to 7 billion customers all over the world, a fact that all Electrical engineers can be proud of. With the world seeking a solution to meet the existing power crisis, this article takes you through a long-term vision, “Electricity scenario in the year 2050”. This is just a statement ensuring we work hard to give the future generation a power crisis free world to work with. The demand for electricity is definitely going to increase by the year 2050 as the use of fossil fuel must be substituted and as of now the only available substitute is electric power. The electric power demand is nearly 100% times the demand of 2010. The graph is obtained from values based on optimal power system solutions. The value of 40,000 TWh is certainly the best case scenario. If electricity is used for charging vehicles in the future the demand will certainly go up. The energy which is available for consumption is more or less going to be the same for the next 50 years. The table below represents the electric power produced and the energy consumed to produce electric power. Primary Energy Consumption is expressed in Mtoe (Million tonnes Oil equivalent). 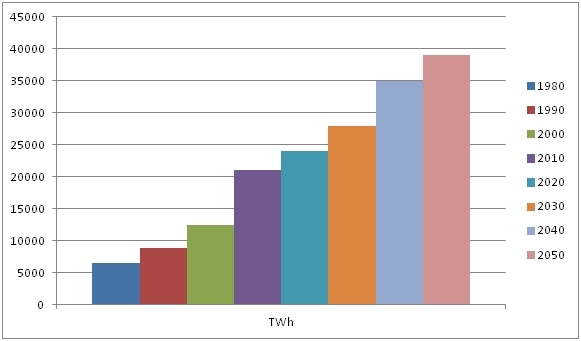 Electric Power Generated is expressed in TWh. The graph clearly shows that most of the energy input is consumed in the transformation of one form of energy to another. At present, Coal, Oil and gas power plants contribute around 65% of the power generated. 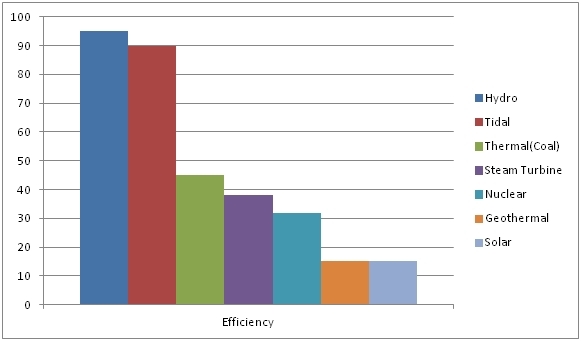 As the efficiency of these three power plants is pretty much less than 50%, the overall efficiency is confined to a lesser than 50%. If the average efficiency is increased to a value of 75% then the power crisis ghost will not be able to haunt us in the future years. The graph is based on the values obtained from eurelectric. 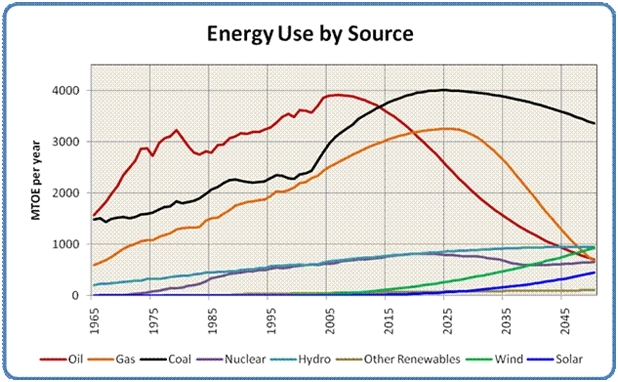 The supply of oil and gas fuels which are the major contributors as of now, will decline very steeply during the mid of the 21st century, as you can see from the energy use by source table. The power produced due to solar, tidal and hydro energy is expected to be pretty much higher than the anticipated value in the graph. The graph was created by “Paul Chefruka”. So, a sincere thanks to Paul. Nuclear energy is not desired by nations, as most of the nations and organizations are only willing to use a renewable resource and are planning to their best to reduce the emission of CO2, the use of nuclear energy is not expected to play a major role in power production. I cannot even think of a day in my life without electricity. Even if we are able to meet the demand, Can we guarantee continuous supply? If a war occurs between two nations, the power supplying stations would be the first target. What would we do at that time? Despite producing surplus energy what would happen in case of a pole shift? The electricity distribution would be indefinitely halted. These kinds of situations are really worrying. With current developments in the research of using non-conventional energy sources, the year 2050 would definitely be an energy crisis free year. Organisations discussing and writing about 85%, 90%, 95% and 100% use of renewable energy consumption are very pleasing. The report of WWF, “Energy report, 100% renewable energy by 2050” is very promising. With countries discussing about reducing CO2 emission, 2050 will be a year where energy would be produced without harming the nature. As mentioned the electricity generated will definitely meet the demand. Instead of using technical terms and discussing various technical strategies, one of the best ways of generating electricity is saving electricity. “The electricity saved is the electricity generated without depleting any resource “. We should use electric power responsibly. Even if a situation comes where we have surplus electric power, electricity should not be used unnecessarily. Using electricity without any limit just because it is available in large quantity and that you pay for the power used is not a good attitude. We have over the years planned so many methods of producing electricity, including the renewable and the eco-friendly techniques to generate electricity. It is up to the future generations to take the lead and produce electricity without compromising the safety of our planet. What’s your opinion about this scenario? What do you think the world will be in 2050? Are you optimistic or pessimistic? or copy this trackback: http://engineering.electrical-equipment.org/others/year-2050-in-terms-of-electrical-power-scenario.html/trackback from your own site. The article as a whole is interesting to read through. One major subject that we are missing here is the chart against energy saving activities that is implemented through out the world. If the data is VS with energy generation. we can have a better understanding on the energy vs energy saving initiatives. I can say with confidence that I’m one of the few looking and developing a new technology for and creating Electricity, let me explain, the generator has not changed much other then coils, phase, ect. more than two times of the present level.